Bollywood film Happy Bhaag Jaye Gi which was due to release on 19th August 2016 in Pakistan has been delayed as the film has failed to get the censor certificate required for its screening. As per BBC Urdu, Mubashar Hassan the chairman of the Central Board for Film Certification (CBFC) has said that initially the film was watched by six members where three rejected the film and three deemed it fit for screening. Upon not reaching a majority decision the film was presented before the full board of CBFC which comprises of all nine members of CBFC. The full board raised objections on many scenes of the film and in any such case the film is referred to the National Ministry of Information, Broadcasting and National Heritage. As per Mobashar Hassan the film has some derogatory remarks about the founding father of Pakistan Quaide Azam Muhammad Ali Jinnah as well as few objectionable references towards Pakistan. So now the decision of screening of this film lies with the Federal Ministry of Information. Last month another Bollywood film Dishoom also faced the similar fate. As per BBC Urdu, Happy Bhaag Jaye Gi is the story of a run away bride of Indian citizenship who runs away at the night of her wedding and hides herself in a truck. The truck crosses the border and comes to Pakistan and thus the bride also arrives accidentally in Pakistan. Pakistani artists Javed Sheikh and Moomal Sheikh have also worked in this film. The promotion of the film was in full swing where the distributor IMGC has advertised the release of the film in all the leading Urdu and English daily. 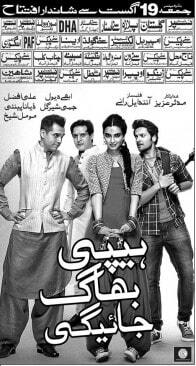 However the poster of this film published in the papers has no image of either Moomal Sheikh or Javed Sheikh.